The sky over the Mumbai domestic airport on the 29th evening holding rain to be unleashed.. This guy is a frequent visitor, specially just before and during monsoons. Click on the photograph for a heightened experience. 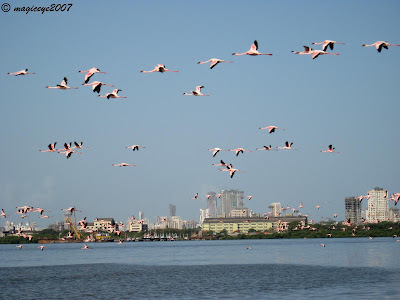 Another flock of flamingos on their way... Click on the photograph for a heightened experience. 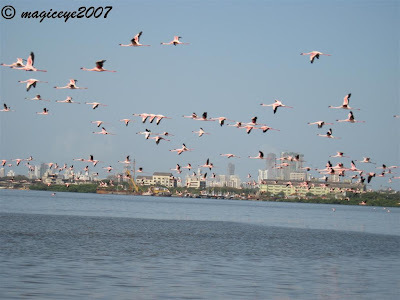 The flight of the flamingos is a treat to watch.. Click on the photograph for a heightened experience. After the celestial fireworks it poured continously leading to water logging in several places. The water receded after about 3 hours. 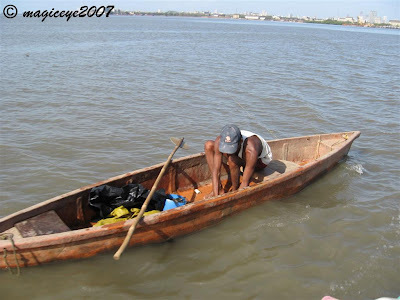 The stormy weather was due to a depression in the Bay of Bengal. 23rd night onwards we have had thunder and lightning, scaring poor Bozo under the table! This was accompanied by strong gusty winds and rains.... more about it in the next post. 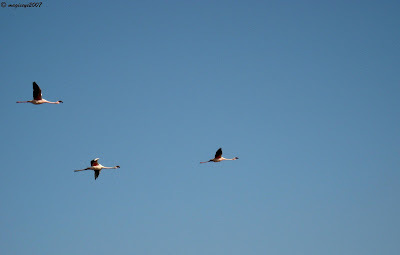 ...we were surprised by a huge flock of flamingos flying past! Will post these few pictures over the next couple of days. 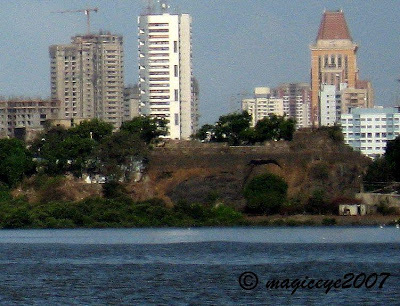 The ruins of the Sewri Fort as seen from the Sewree creek. 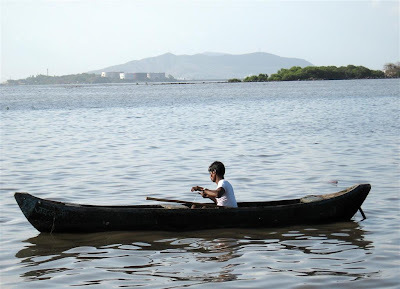 Unique way to go fishing! 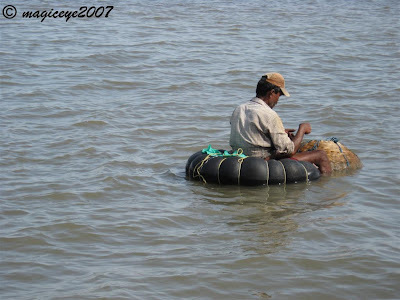 This guy has just started out on his own and cant affoard a boat as yet so he has this makeshift contraption of a tyre tube in which to sit attached to a creel. It works for him! Ingenuity! 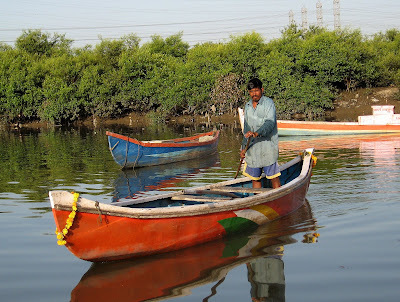 A fisherman inspecting the nets laid out in the Mahul creek. 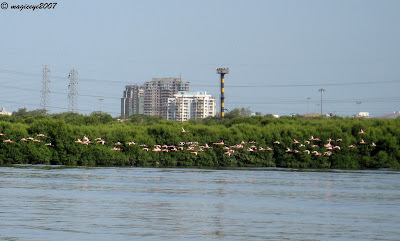 Now we will see the different sights that we come across on our flamingo sighting trip. 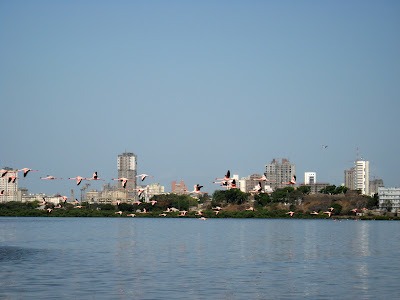 Three flamingos on their way away from gawking bird watchers of Mumbai! 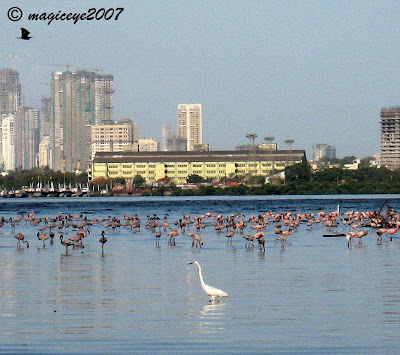 Taking the cue, two flamingos decided to fly away to a secluded place in crowded Mumbai! And then there were some more flamingos...looked as if they were having a small little party with their favorite algae on the menu! 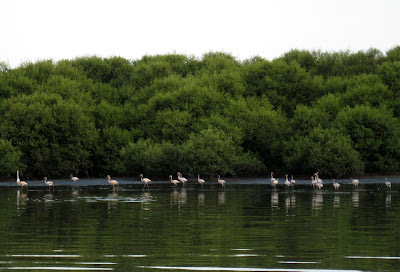 Up ahead in the distance we saw a row of flamingos strolling along..... in the Mahul mudflats where they come for nesting. 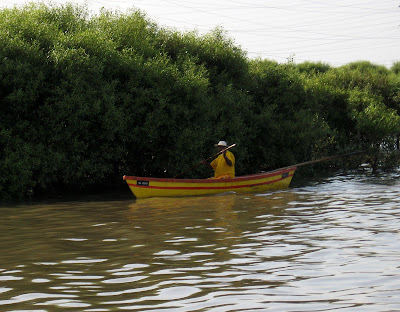 Here they get to eat the particular algae which colors them pink. 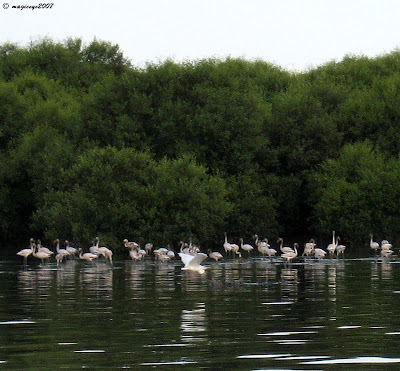 We are off on the flamingo sighting expedition in the mahul creek at last! 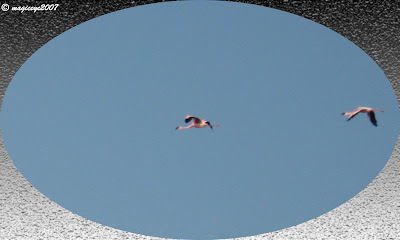 And there we spot the 1st bird....not a flamingo though. Can fellow bloggers identify it please? 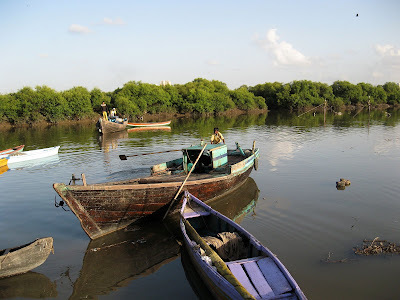 Getting the boats ready to take us for flamingo sighting in the Sewree mudflats from Mahul jetty. 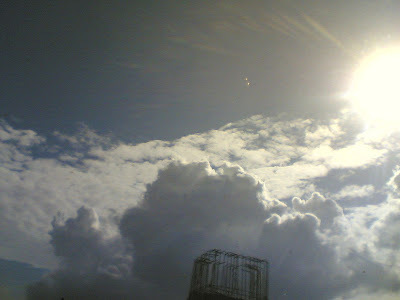 The sky as seen this morning at the mumbai domestic airport. Though it looked as if we would have thunderstorm, it all ended in a whimper...no rain only rising temperatures with rising humidity.. 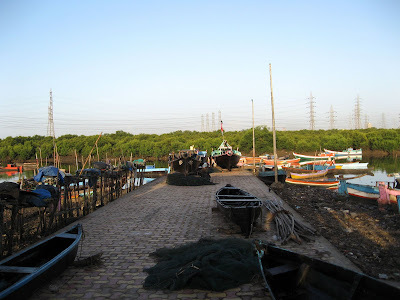 This is the Mahul jetty from where we will board the boat to go flamingo watching! 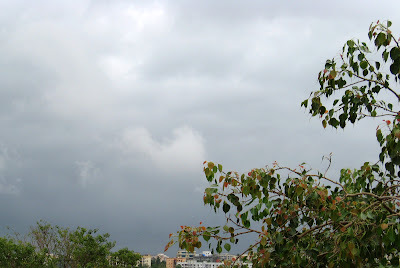 We had premonsoon showers last evening bringing the much awaited drop in temperature, albeit slight drop. This was the picture at Shivaji park signal. Opposite is the Sena Bhavan the Headquarters of a political party - Shiv Sena. Rows of stacked nets for catching crabs lined up along the jetty with other fishing equipment. 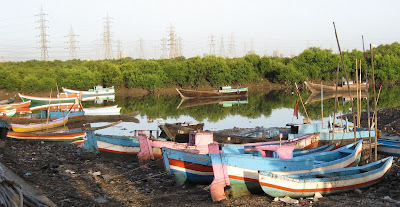 Boats used for fishing in the Mahul river that flows into the Mahul/Sewree creek. 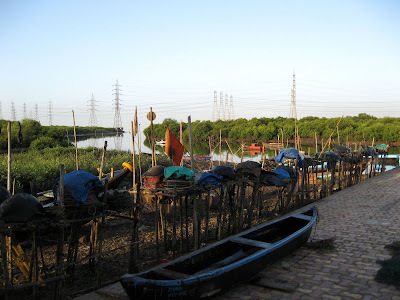 Took this photograph while i waited for a boat to take us for Flamingo bird watching in the Sewree mudflats and Mahul creek.